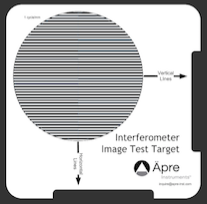 ÄPRE is offering a free interferometer image resolution test target. The target is simple to use without requiring complicated and expensive phase stepped optics. Simply place the 1-cycle/mm test target in front of your interferometer and look at its image on your camera. If you cannot see these lines, you cannot measure surfaces to these fine of details. Also if a zoom system is present you can zoom in and see if the resolution improves, stays the same or degrades. Send us your contact information including your email address and mail delivery address and we will mail you a target. Here is shown a Generation II interferometer (Ground Glass with Continuous Zoom Imaging System) demonstrating lost resolution at the edges of the field.